Hacksaw blades are available in various standardized sizes in HSS (High Speed Steel), Bi-Metal and Low Alloy with key features of Strength, Flexibility and Longer Life. We offer alloy steel flexible hand hacksaw blades, which are highly acclaimed for their precise cutting and high durability. These blades are flexible and virtually unbreakable with wear resistance and safety. Range of crown flexible blades are made in compliance with international standards with optimum thickness and length. - Blade Length: 10", 12", 13"
We are supplier of Hacksaw Blades. Our products are made from high quality of raw material and latest technology. These are available in different metals and are widely used for various cutting applications. These are known for their sturdiness and corrosion resistance. 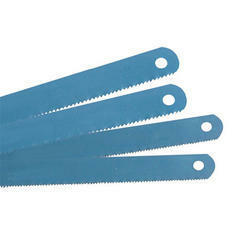 In order to cater the variegated demands of our esteemed clients, we are manufacturing a wide range of Hacksaw Blade. We are engaged in offering Hand Hacksaw Cutting Blade which is manufactured using advanced technology at manufacturer’s end. The raw material used in manufacturing is tested on various parameters to ensure proper functioning. In order to suitably meet the varied application requirements, we can get this product customized. 75% advance and rest on dispatch. 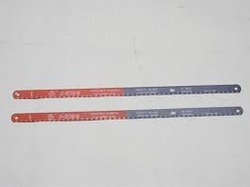 In order to enhance superior functioning of our Hacksaw Blades, we use superlative grade raw material that is in compliance with the international quality standards. Further, our blades are beneficial to improve the productivity of different kinds of cutting tools. Moreover, these help in reducing inventory of different TPI blades and are thus in great demand in the market. Miranda Tools offers Hacksaw Blades. It is made from superior grade high speed steel. It is specially developed for cutting alloy steels and hard materials.